Wow! 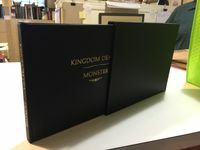 Duncan at Campbell-Logan Bindery in Minneapolis has once again outdone himself! Hope Poots sees this. Duncan is trying to reach him to see if he can do some special edition hard bounds for the next printing. Haven't got the bill yet. I'm sure it will be worth it. What's your estimate on that? Beautiful. I want the same. Question. I've already had all of my rules, including expansions, spiral bound. Do you think this gentleman can still bind it in the same fashion as yours? I've actually worked on perfect bind machines before, but I never did a book that was already punched for spiral binding. Glue needs to be applied in those areas. Unless this is bound in a different way? Estimate was about $85 for the binding and embossed cover, and about $30 for the slipcase. I will post more details as soon as I pick up the book and settle my bill. In response to the question regarding hard binding a prior spiral bound book, the answer is "it's possible". I did this with one of my rule books. Duncan can provide more details but it involves trimming a bit of the edge. Worked great. Don't think it cost any more than the $75-80 for regular binding. And yes, Duncan mentioned that discounts start at just 2 books. 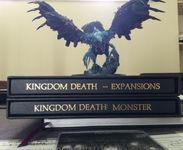 So if you bind both your main rule books and all your expansions you will save a few bucks. Duncan is on BGG but best to give him a call. Super nice guy. He wants to work with Poots! Here's my invoice for the expansions bound and 2 slipcases. The 30 dollars is a discount from Duncan (not standard). Also included is pics of the main rulebook in its slipcase. Top notch work from Duncan and his crewe of Crazy Bibliophiles! Duncan and his partner Mari will be watching this thread so if you have any questions throw 'em out! Thats some great looking binding there. I really like that. 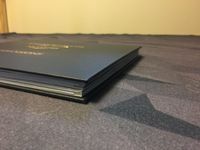 Hey there, for pricing please email mari@campbell-loganbindery.com We can explain all the options to customize your book! Hey Ben, thanks AGAIN for the love!! How eyewatering would international shipping be? Drop them a call or email Duncan or Mari. The awesomeness is worth it! 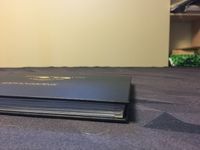 We do not use adhesives to bind glossy pages as it comes off. Ben's project was sewn. Spiral binding can be converted, we did one for Ben. sewing steps into the book about 1/4-inch past current spiral holes - holes cut off for sewing. Pics below of Ben's spiral bound margins after sewing - tighter margins, but not overly so. @Blunder1983 I will check with Duncan. Feel free to email us! +1 for international shipping quotes. For the expansion rulebook binding, how were the different expansion booklet sizes handled? If you stack all the expansion rulebooks up and compare them, or even pull out a tape measure and measure them, they were all cut at different lengths and don't quite all match up - even worse, it looks like the "page displays" were stretched to fit them differently, so I'd be worried about uniformly chopping up the rulebooks to a certain size. Was a good solution found to this? Beautiful work on these books! Here are some pictures of the page edges. Slight differences in page lengths but nothing dramatic. My copy of Kingdom Death is waiting for me in USA when I get back there I will contact these guys about doing this. It is amazing and the quality looks good. Sorry if it was brought up before and I missed it but what was the lead time? After they have the book in hand, it's about 2 weeks for a book and slipcase to be completed. Factor in shipping both ways and about 3 weeks or so. It looks great for prosperity but I wouldn't use it in game because I like to be able to flip it back with my spiral bound copy. Did you get your settlement locations sleeved too?